Finally, four years after launch of Klout, the website that measures the online influence of people, President Barrack Obama’s Klout score has overtaken that of Justin Bieber. 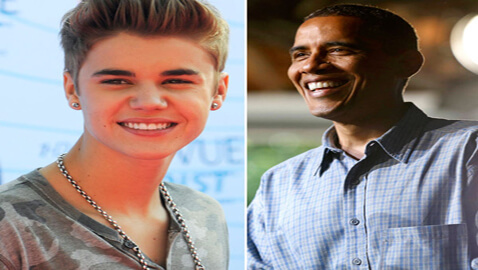 Chief executive of Klout, Joe Fernandez said, “Barrack Obama is hugely important … He’s referenced everywhere, and that gives him a higher score.” Until now, the person with the highest Klout online was Justin Bieber, whose 26 million followers retweet everything he tweets, apparently. While the news is happy news for the election year, and shows a more realistic approach of measuring actual social influence by Klout – the difference in scores did not happen automatically, but by reorganizing and changing Klout’s algorithms. The new algorithm employed by Klout takes into account the number of references in a person’s Wikipedia page, as well as descriptions on LinkedIn profiles and other factors into account. Talking to the media Fernandez said, “We heard the common complaint, “Klout’s interesting, but what about people who are influential in the real world?’” And to remain in touch with, and increase its relation with actual reality, the social influence measurement company changed its algorithms. Now they are in touch with reality. The President of USA is the most influential person in the world admitted by Klout. The new Klout score is based on 400 variables, of which the number of Twitter followers of a person, or the number of ‘likes’ received on Facebook are only individual variables.